This collar is fused in such a way as to provide a 'full' look. Appearing thicker than most factory produced collars, it is stiffer and projects a luxurious look. 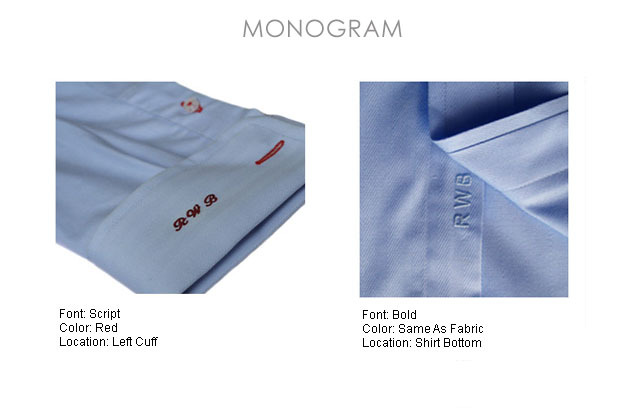 Popular amongst corporate and formal shirts. This collar is fused making it firm and stiff. However it is less thick and less stiff than the Luxury Collar giving it a lighter look. Popular for day-to-day coporate shirts. No fusing is used on the casual collar. The fabric is sewn but left loose. This creates a casual floppy collar. Projecting a more casual modern look, this style is increasing in popularity. Superfine 100% Italian Cotton. This is a light weight summer fabric with a fine twill weave. Soft to the touch, and breathes very well. 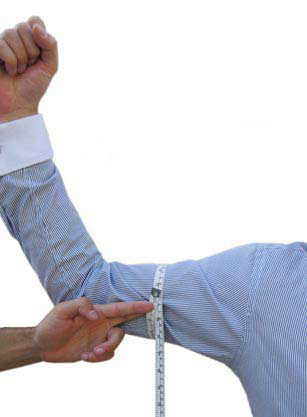 You have the choice to provide measurements from your body, measurements from a well fitting shirt, or you can select from standard sizes. Use our simple step-by-step guide to measure your body. 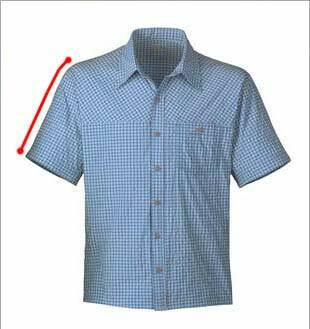 Use our simple step-by-step guide to measure an existing shirt you own. No measurements requierd. Select from our standard sizes. Height What is your Height?124 cm / 4’1"125 cm / 4’1"126 cm / 4’2"127 cm / 4’2"128 cm / 4’2"129 cm / 4’3"130 cm / 4’3"131 cm / 4’4"132 cm / 4’4"133 cm / 4’4"134 cm / 4’5"135 cm / 4’5"136 cm / 4’6"137 cm / 4’6"138 cm / 4’6"139 cm / 4’7"140 cm / 4’7"141 cm / 4’8"142 cm / 4’8"143 cm / 4’8"144 cm / 4’9"145 cm / 4’9"146 cm / 4’9"147 cm / 4’10"148 cm / 4’10"149 cm / 4’11"150 cm / 4’11"151 cm / 4’11"152 cm / 5’0"153 cm / 5’0"154 cm / 5’1"155 cm / 5’1"156 cm / 5’1"157 cm / 5’2"158 cm / 5’2"159 cm / 5’3"160 cm / 5’3"161 cm / 5’3"162 cm / 5’4"163 cm / 5’4"164 cm / 5’5"165 cm / 5’5"166 cm / 5’5"167 cm / 5’6"168 cm / 5’6"169 cm / 5’7"170 cm / 5’7"171 cm / 5’7"172 cm / 5’8"173 cm / 5’8"174 cm / 5’9"175 cm / 5’9"176 cm / 5’9"177 cm / 5’10"178 cm / 5’10"179 cm / 5’10"180 cm / 5’11"181 cm / 5’11"182 cm / 6’0"183 cm / 6’0"184 cm / 6’0"185 cm / 6’1"186 cm / 6’1"187 cm / 6’2"188 cm / 6’2"189 cm / 6’2"190 cm / 6’3"191 cm / 6’3"192 cm / 6’4"193 cm / 6’3"194 cm / 6’4"195 cm / 6’5"196 cm / 6’5"197 cm / 6’6"198 cm / 6’6"199 cm / 6’6"200 cm / 6’7"201 cm / 6’7"202 cm / 6’8"203 cm / 6’8"204 cm / 6’8"205 cm / 6’9"206 cm / 6’9"207 cm / 6’9"208 cm / 6’10"209 cm / 6’10"210 cm / 6’11"211 cm / 6’11"212 cm / 6’11"213 cm / 7’0"214 cm / 7’0"215 cm / 7’1"216 cm / 7’1"217 cm / 7’1"
The chest measurement should be taken around the chest. Standup in a relaxed posture. Do not tighten the tape measure too much. The waist/stomach measurement should be taken around the stomach. Stand up in a relaxed posture. Do not tighten the tape measure too much. The hip measurement should be taken around the buttocks. Stand in a relaxed position and do not over tighten the tape measure. 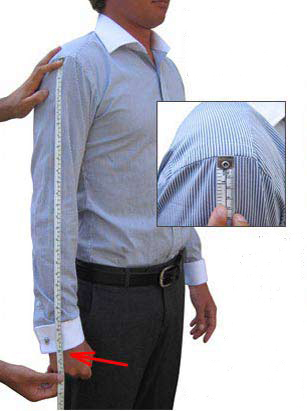 The length measurement should be taken from the top of the shoulder at the point near the neck, along the front of your body, to a point where you want the shirt to end. Standup in a relax posture. 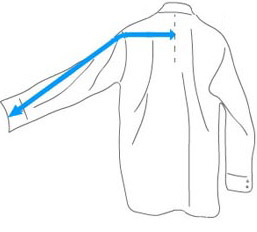 Measure down the sleeve from the corner point (where the shoulder meets the arm) down to the end of your short sleeve. 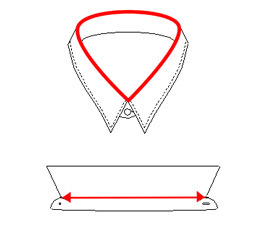 Measure across the cuff at the end of the short sleeve, as shown in the photo. We will make the finished shirt to this size. Height What is your Height?128 cm / 4’2"129 cm / 4’3"130 cm / 4’3"131 cm / 4’4"132 cm / 4’4"133 cm / 4’4"134 cm / 4’5"135 cm / 4’5"136 cm / 4’6"137 cm / 4’6"138 cm / 4’6"139 cm / 4’7"140 cm / 4’7"141 cm / 4’8"142 cm / 4’8"143 cm / 4’8"144 cm / 4’9"145 cm / 4’9"146 cm / 4’9"147 cm / 4’10"148 cm / 4’10"149 cm / 4’11"150 cm / 4’11"151 cm / 4’11"152 cm / 5’0"153 cm / 5’0"154 cm / 5’1"155 cm / 5’1"156 cm / 5’1"157 cm / 5’2"158 cm / 5’2"159 cm / 5’3"160 cm / 5’3"161 cm / 5’3"162 cm / 5’4"163 cm / 5’4"164 cm / 5’5"165 cm / 5’5"166 cm / 5’5"167 cm / 5’6"168 cm / 5’6"169 cm / 5’7"170 cm / 5’7"171 cm / 5’7"172 cm / 5’8"173 cm / 5’8"174 cm / 5’9"175 cm / 5’9"176 cm / 5’9"177 cm / 5’10"178 cm / 5’10"179 cm / 5’10"180 cm / 5’11"181 cm / 5’11"182 cm / 6’0"183 cm / 6’0"184 cm / 6’0"185 cm / 6’1"186 cm / 6’1"187 cm / 6’2"188 cm / 6’2"189 cm / 6’2"190 cm / 6’3"191 cm / 6’3"192 cm / 6’4"193 cm / 6’3"194 cm / 6’4"195 cm / 6’5"196 cm / 6’5"197 cm / 6’6"198 cm / 6’6"199 cm / 6’6"200 cm / 6’7"201 cm / 6’7"202 cm / 6’8"203 cm / 6’8"204 cm / 6’8"205 cm / 6’9"206 cm / 6’9"207 cm / 6’9"208 cm / 6’10"209 cm / 6’10"210 cm / 6’11"211 cm / 6’11"212 cm / 6’11"213 cm / 7’0"214 cm / 7’0"215 cm / 7’1"216 cm / 7’1"217 cm / 7’1"
The collar measurement should be taken from the outer edge of the buttonhole to the center of the collar button when the collar is spread flat. Measure straight across the chest from one armpit to the other. 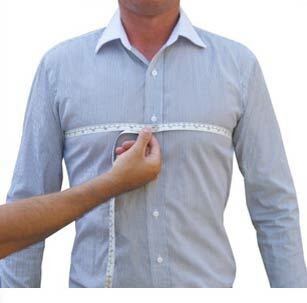 Do not stretch apart the shirt when taking the measurement. 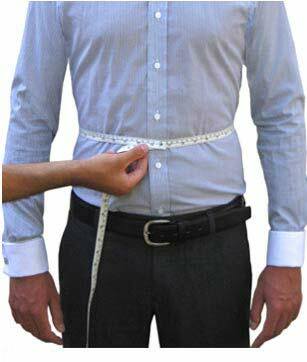 The waist measurement should be taken across the width of the shirt at the narrowest point. 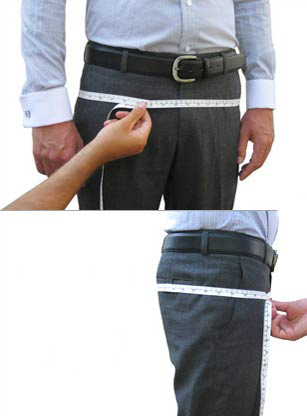 The hips measurement should be taken accross the bottom of the shirt at the end of side seams. 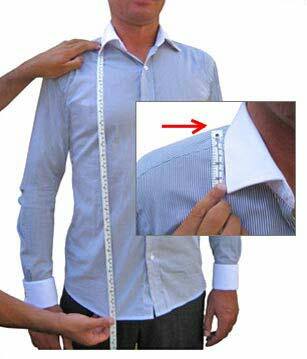 Do not stretch the shirt apart too much when taking this measurement. Measure from the seam at the top of the shirt down the edge at the bottom of the shirt. The sleeve length measurement should be taken from the shoulder/sleeve seam along the upper edge of the sleeve to the edge of the cuff. Measure the length the sleeve, starting at the shoulder seam, down to the edge of the sleeve. 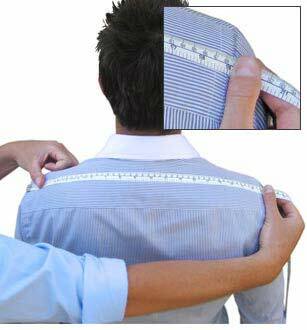 The shoulder width measurement should be taken between the shoulders at the sleeve seam. The arm hole measurement should be taken as a straight line from the shoulder/sleeve seem to the lower corner where the sleeve meets the body. Measure across the width of your sleeve where the bicep would be. This is about 3 inches down from the armpit seam. Note that we use this measurement as a guide, and will construct your sleeve to match the contours of the rest of the shirt. 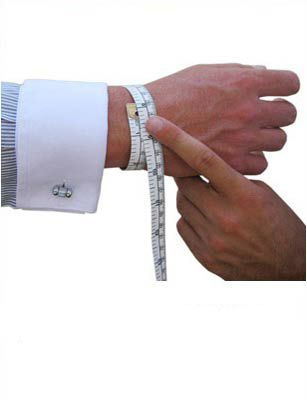 The cuff measurement should be taken when the cuff is spread flat. Button Cuffs: Measure from the outer edge of the cuff button hole to the centre of the button French Cuffs: Measure from the outer edge of the cuff link holes. 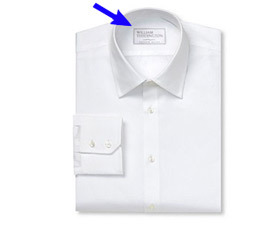 The collar and sleeve measurements can usually be found on the sizing label of an off-the-rack dress shirt. 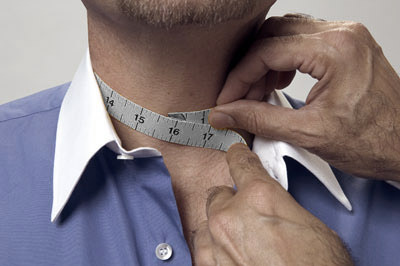 The collar size is simply the circumference of the collar on the shirt. Taken from the edge of the collar button hole to the center of the button. The sleeve size is taken from the middle of the back down to the edge of the cuff. Note that the Standard Sleeve Size is different to a Made-To-Measure Sleeve Size. Height What is your Height?124 cm / 4’1"125 cm / 4’1"126 cm / 4’2"127 cm / 4’2"128 cm / 4’2"129 cm / 4’3"130 cm / 4’3"131 cm / 4’4"132 cm / 4’4"133 cm / 4’4"134 cm / 4’5"135 cm / 4’5"136 cm / 4’6"137 cm / 4’6"138 cm / 4’6"139 cm / 4’7"140 cm / 4’7"141 cm / 4’8"142 cm / 4’8"143 cm / 4’8"144 cm / 4’9"145 cm / 4’9"146 cm / 4’9"147 cm / 4’10"148 cm / 4’10"149 cm / 4’11"150 cm / 4’11"151 cm / 4’11"152 cm / 5’0"153 cm / 5’0"154 cm / 5’1"155 cm / 5’1"156 cm / 5’1"157 cm / 5’2"158 cm / 5’2"159 cm / 5’3"160 cm / 5’3"161 cm / 5’3"162 cm / 5’4"163 cm / 5’4"164 cm / 5’5"165 cm / 5’5"166 cm / 5’5"167 cm / 5’6"168 cm / 5’6"169 cm / 5’7"170 cm / 5’7"171 cm / 5’7"172 cm / 5’8"173 cm / 5’8"174 cm / 5’9"175 cm / 5’9"176 cm / 5’9"177 cm / 5’10"178 cm / 5’10"179 cm / 5’10"180 cm / 5’11"181 cm / 5’11"182 cm / 6’0"183 cm / 6’0"184 cm / 6’0"185 cm / 6’1"186 cm / 6’1"187 cm / 6’2"188 cm / 6’2"189 cm / 6’2"190 cm / 6’3"191 cm / 6’3"192 cm / 6’4"193 cm / 6’4"194 cm / 6’4"195 cm / 6’5"196 cm / 6’5"197 cm / 6’6"198 cm / 6’6"199 cm / 6’6"200 cm / 6’7"201 cm / 6’7"202 cm / 6’8"203 cm / 6’8"204 cm / 6’8"205 cm / 6’9"206 cm / 6’9"207 cm / 6’9"208 cm / 6’10"209 cm / 6’10"210 cm / 6’11"211 cm / 6’11"212 cm / 6’11"213 cm / 7’0"214 cm / 7’0"215 cm / 7’1"216 cm / 7’1"217 cm / 7’1"
The Slim fit shirt is more tapered to the body, accentuating the body's shape and is generally suited to men with a lean or athletic build. The Regular fit is less tapered than the Slim Fit providing a little more room and is generally suited to men with an average build. The Loose Fit provides a lot more room to move. It is suited to bulkier men, or those who like their shirts to have a baggier fit. This soft fine light blue pinstripe is a very diverse shirt and a safe option for most wardrobes.